Make platforms part of your digital transformation. We help you to spot the right market opportunities and integrate new business models into your digital strategy. Use our lean innovation process to accelerate your platform journey – from ideation, prototyping to growth. Blockchain brings true decentralization to the platform economy and enables a fair market. We help you to understand the potentials of Blockchain and to design decentralized business models. Organizations are platforms and have strong similarities to open market places. We help you to grow your organization into an excellence team where everybody achieves more and is happier. Make a move from a product / service provider to a platform owner. We help you to define a platform vision and growth strategy where you can gain advantage over your competitors or disrupt markets. With our Lean Platform Innovation process we support you to make your platform a reality. The focus is on prototyping and market validation, gaining first tracktion and inginition of the network effect. Blockchain enables true decentralized marketplaces and business models. But it requires a deep understanding, not only of the technology, but also the differences to current digital business model mechanics, like governance and network effect. We help you to understand and to spot new opportunities. We also give advisory on improving or growing your blockchain business. To make your organization ready for digital transformation it needs an upgrade – from classic hierarchy to an open marketplace character where everybody – from employee, manager, top executives – gain more and is truely inspired and happy. We bring platform thinking into your HR and org teams to see similarities and understand the mechanics of an open culture. In our 3-day Platform Innovation Workshop we guide you from ideation to platform strategy. Our experienced platform expert will help you to get started with the first steps towards prototyping and implementation. Our methodology is based on client experience and platform business best practices from companies around the world. 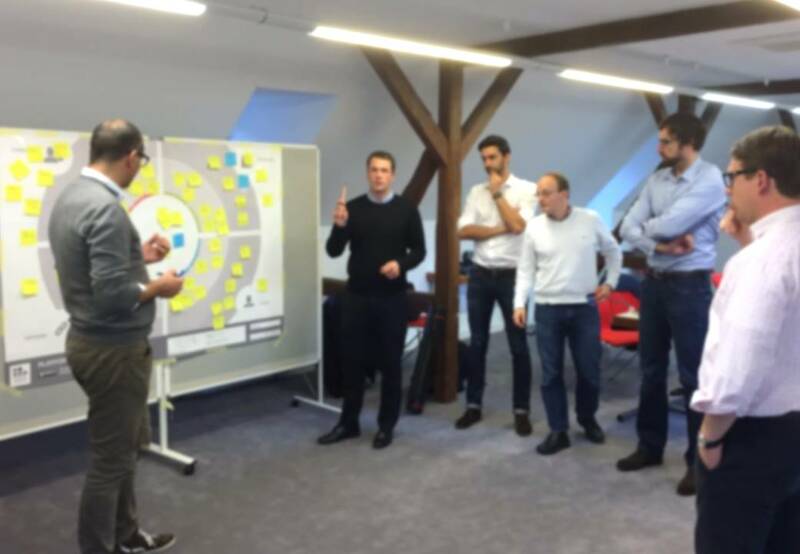 Together with co-creation techniques like Design Thinking and Lean Startup we ensure a hands-on experience and real world feasibility. The Platform Innovation Kit is an excellent tool to design platform business models. Our methodology is a global movement and used by corporates, startups and venture accelerators & incubators. It is also adopted and part of education programs of Universities and Business schools around the world.